The unrelenting seduction of Oleander’s cool, flawless skin—and deep, captivating eyes. The concern in his voice—the touch of his hand. The exhilaration and pride elicited by the sight of Oleander waiting for him after the visit with his family had left him feeling disappointed and unfulfilled. Amidst the chaos of his sexual reckoning, Timothy is compelled to uphold an intimate pact struck between himself and Oleander, and chooses to follow him north to Drakkar Castle—the threat of war upon them. Grimmr Coven is advancing deep into Drakkar Coven territory, and only Oleander may know the reason why. He had lived amongst the Coven Grimmr for many decades with his human lover, Torkel, and fears that a far greater threat is coming, forcing Grimmr Coven south into Drakkar Coven territory. Left behind while Oleander goes in search of answers, Timothy’s inner turmoil becomes unbearable. His only company enroute to Drakkar Castle, Alexis, a vivacious, blue-eyed seductress with a secret, intent on stealing him away for reasons that would launch the already fractured family of Drakkar at each other’s throats. Find it on Amazon, Barnes and Noble, All Romance eBooks, or Goodreads. A nervous thirst gripped Timothy as he acknowledged his acceptance of the terms Oleander spoke of, despite having little clue of what was to be asked. He reached for the nearest glass, praying it was filled with wine, his trepidation mounting. “Proceed,” he said, the tightness in his chest relinquishing somewhat as the full-bodied offering he had chosen trickled warm and comforting down his throat, infusing his body steadily. Oleander rolled his shoulders and set his stance, attempting to exude confidence where truly, there was none. Timothy reached for the hand Oleander had pressed to the tabletop, and stroked his fingers across it. Oleander simply nodded then removed his hand from beneath Timothy’s, wandering off in the direction of the window. He moved a heavy curtain aside, staring out at the moon, then let the curtain drop. Its illumination would soon be guiding him home. “I will be heading to Drakkar Castle at next moonrise to take my place at my father’s side in preparation.” Oleander turned and leaned against the wall, crossing his arms. His place at his father’s side—he sneered. An honorary position that was only extended to him during times of unrest and war. His father, arrogant and oblivious to what was truly coming—that a far greater threat was gathering; a threat that was likely the reason Grimmr was scouting south into Drakkar Coven territory. A threat with which he was all too familiar. He exhaled and dusted away the direction his thoughts were taking him, returning his attention to Timothy. “Oh.” Timothy sunk back into his seat. “Then, I am uncertain.” He picked at the edge of the table, considering what his life would look like if he remained behind. Perhaps he could rearrange his sleep pattern in Oleander’s absence and help work the farm each day. He scratched his head. Doing so would closely resemble his old life. A life with which he had been completely unsatisfied. Aside from farming, the castle had little to offer him. Oleander studied Timothy, admiring the striking, masculine beauty of his companion. The feel of Timothy’s body beneath his own, gasping and mewling, challenging him to continue the pain, had been truly exquisite. He could spend an eternity eliciting such responses from him. Losing him would be painful. Oleander placed a hand to his heart and bowed. Timothy set his hands on the table to steady himself. Ever since he had arrived at the castle, he had been seeking to escape and return home. Now he was being offered the opportunity to leave the castle forever. To leave Oleander behind—forever. Timothy glanced up at Oleander, who was studying him anxiously. “But what of our agreement?” he asked. “You …” Oleander lifted a hand to his face, touching his lips, unable to respond, his astonishment so complete. It had not even occurred to him that his new companion would factor their agreement into his decision. He had fully expected Timothy to return home to his family—reclaim his freedom. He moved to speak, to clarify his offer of freedom, but the state of Timothy’s demeanor as he approached left him speechless. An uncompromising decision had been made. 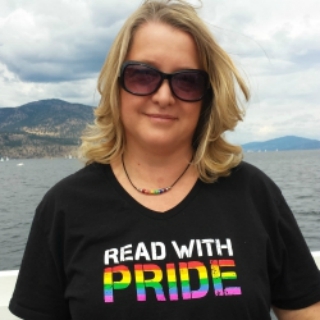 Leigh Jarrett is a bestselling Canadian author of LGBTQ Romance. Queer, quirky, and passionate. Lover of antique stores, the smell of lye and oil as it turns to soap, cathedral groves, and bright colors. In her hometown of Kelowna, BC, Leigh is an advocate for the LGBTQ community, celebrating their diversity, and affirming their most basic of human rights–to love and be loved. Find her on Amazon, her Facebook Page, her Facebook Profile, her website, Twitter, or Google+. Leigh Jarret has offered two giveaways for this tour! One commenter on each blog during the tour will be entered to win a signed book mark. There will also be a tour-wide Rafflecoptor to win another signed bookmark and a signed paperback of Oleander. Both giveaways are open to readers in the US and Canada. Huzzah, gentle readers! Grime has arrived! The Book Of Daniel is now in print for those of you who like to put your books on a real life shelf so you can actually touch (and sniff…or is that just me?) them.